Communication in a workplace is still a driving force for efficiency, productivity and safety. It keeps your employees and team members in connection with the happenings of the day, and sets expectations as plans change. A number of industries across Canada continue to rely on two way radio technology as their form of team communication throughout the work day. They’re effective, and have been proven to reduce downtime by 20 per cent or more across various industries. With the latest integration possibilities from Motorola, however, industries are not limited to individual technologies. Previously, the technologies below used to work independently within a work environment, but advancements have enabled each of them to work together, providing seamless communication across all of the platforms – including two way radios. The question may be ‘why choose a two way radio, which is one of the oldest forms of communication in the workplace – especially when there’s so many other forms of communication that may complement my needs’? Signal – Let’s face it. Even as cell phone technology develops, and capabilities of communicating with the technology become easier, there are still workplaces that face signal issues if they’re relying on cell phones. Not every cell phone can work in every corner of the warehouse or work site, and that limits communication abilities among team members. 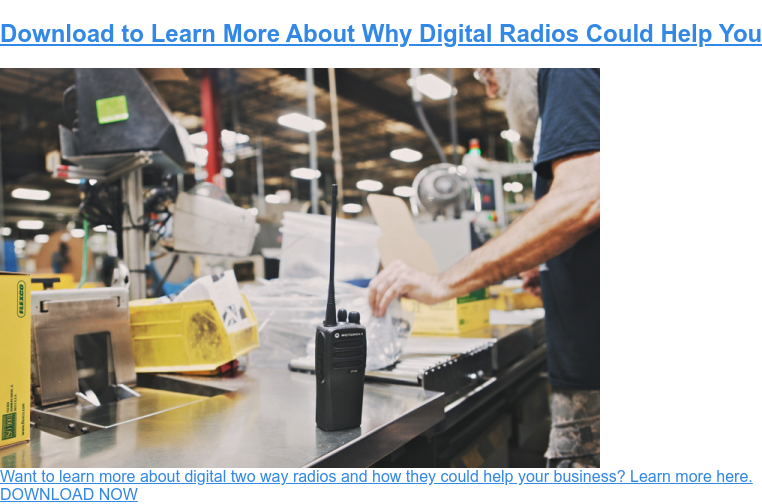 Two way radios (especially the latest in digital two way radio technology) has enabled users to reap the benefits of greater range and better clarity than with cell phones. Durability – Cell phones are not built to be durable. In fact, very few can handle the inevitable drop that happens throughout the day, whether it’s at work or at home. We’ve all seen the cell phone with a cracked screen. You won’t, however, see this with two way radios. Motorola two way radios are built for the toughest industries, and go through a variety of drop, shock and vibration tests to ensure they will live up to your expectations, and continue to work when you need it most. Limitations – If you’re limited to using a landline phone for your workplace communications, you’re also limited in your ability to move around. If you’re away from your desk, and someone is trying to get a hold of you, to get a quick answer for a customer, or deal with a safety concern, how are they supposed to do so? With a two way radio on your person, that’s an easy solve. A quick question and answer, and work can continue. Noise Levels – Imagine a landline phone in a warehouse, or manufacturing plant – or even one in a fire station. Noisy environments limit the ability to hear your team members on the other side of the phone (and plugging your other ear isn’t going to help). With two way radios, that isn’t an issue. The latest technology offers noise reduction capabilities that reduce background noise to better allow messages to come through the first time. Computers / Tablets – Just like with landlines, computers are limiting in your ability to move far from your desk to communicate with your team. Often times, you’re also limited to email communication, and your fellow team members paying attention to their email, too. Tablets, of course, are also not built for the toughest work environments, and are susceptible to issues like dropping and dust. Two way radios are the answer to that concern. Not only are they durable, like we mentioned above, but they’re also built for environments that other technology can often not work in – from dust to moisture and beyond. If you get the right radio (with some ratings as high as IP68) you can expect a completely dust proof and waterproof option for your team member communication. Yelling – First of all, we all know this will work for a while, and in very specific environments. But, when it comes to noisy workplaces, and those with vast space, and employees spread out throughout that space, there is no value in yelling. Not only will you have to scream over equipment, but you also run the risk of not being heard the first time, screaming over other people, and interrupting important conversations to get a message through. 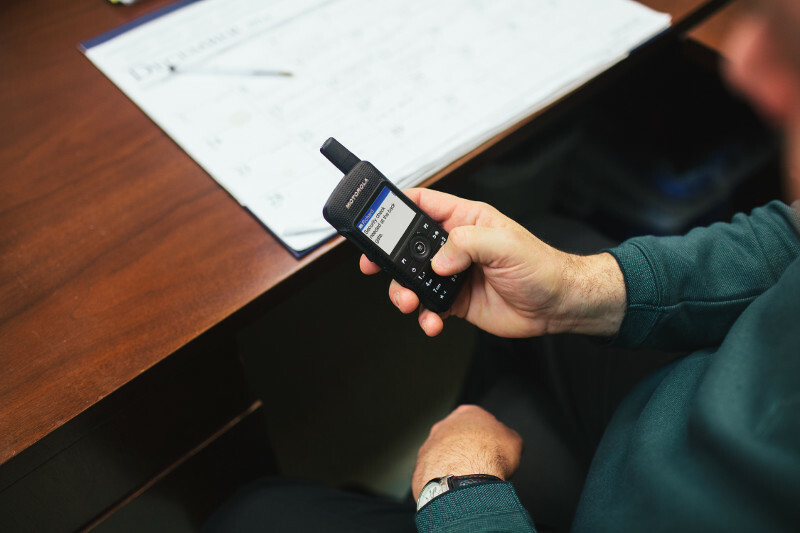 Two way radios can relay a message to one or many, and in a professional form of communication. Not every member of your team requires the same technology to successfully get a job done at the end of the day. Here at Nova Communications, we get that. But we’ve also seen the value two way radio technology has brought to the table for business. With the latest options in two way radios, there is literally something for everyone. From a small, compact but mighty radio for your office and customer service facing employees, to the toughest radio for the toughest users out in the field, the options are endless. We realize that a number of job sites require the technology above – and we get that, too. It’s important to keep in mind that with Motorola’s new team communications portfolio, integration with these technologies is, in fact, possible with your two way radio. With more than 30 years in the business, and having worked with companies like yours across Canada every day, we understand that your needs are different than the next. We’re here to help you figure out the best two way radio technology for not only your business, but your price-point. Contact us today for more information or start with the Portable Radio Selection Guide below for a quick sample of the best two way radios for your needs.